Now I know, that title sounds a little crazy, but that is exactly what the snapper has to do every day on the football team, and it’s not as easy as you might think. Think about it for a minute, you have to properly aim the ball and spiral it about 10 yards behind you. Don't let the lack of name recognition for a minute persuade you that the job is unimportant. Mess up, and it is a probably a TD going the other way. There is big pressure just to throw the ball accurately between their legs while defending the punter. Then they have to run downfield to tackle. The snapper job is very important. In this video, you will see the technique that Alabama coaches teach the snappers at Alabama. The instant the ball is lifted off the ground to throw between the snappers legs; he starts a fast shuffle to protect the punter. 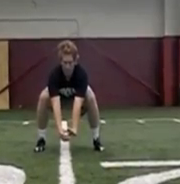 The young man in this video is Alabama's own 6-1 230 lb freshman snapper, Robby Cramer, of Hoover (#50 this year). I am not sure who the starter is at the moment, however you can see the kind of training and dedication it takes to be an elite snapper in the SEC. When you watch this, I hope it gives you a newfound appreciation for the position of snapper. I used to be a center and had to long snap...I know it’s not easy. Think about it when you watch them play Kent State. Check it out the video below! ROLL TIDE!